Here’s something you probably don’t know about Mr. Media. The second of my nine books was actually about football — Why Men Watch Football, in fact. So when the opportunity to interview Bob Horowitz came about, how could I resist? 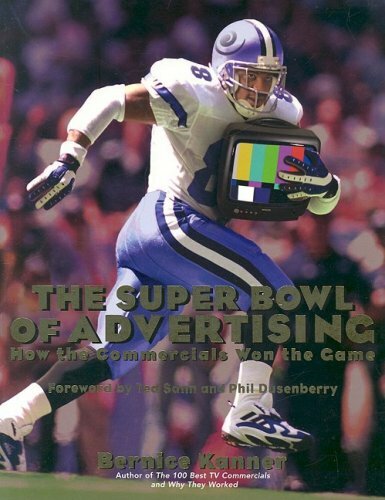 Order ‘The Super Bowl of Advertising: How the Commercials Won the Game’ by Bernice Kanner, available from Amazon.com by clicking on the book cover above! BOB ANDELMAN/Mr. MEDIA: I’m fascinated by your show. As a football fan and someone who’s done a little writing about why men watch football, I actually find it kind of hard to believe anyone still scoffs at the notion that half the fun of Super Bowl is the commercials, but I’m guessing there must be a few. BOB HOROWITZ: The people that scoff at it, I think that’s a major reason for the mega numbers that are associated with the event. It’s funny because, in television, you often hear the season finale of XYZ TV show is going to be brought to you without commercial interruption courtesy of General Motors, Ford, whomever, alright? And that’s done as a media stunt, and they believe that that will help the ratings. Commercials in primetime are limited in terms of breaks, say, versus the sports day part, because they feel that that will help ratings, right? Less commercial interruptions. You have this whole thing about TiVo and fast-forwarding through commercials, and what do you do about that? All of it is 180 degrees different with respect to the Super Bowl. If you took the commercials out of the Super Bowl, ratings would go down. Super Bowl is the only thing that people will TiVo and fast-forward to watch the commercials. ANDELMAN: And of course, there have been many, many years where the commercials have been vastly more interesting than the game itself. HOROWITZ: Right, right. But I think that very much like watching, and this is my personal opinion, like watching a “Saturday Night Live.” Some “Saturday Night Live” skits are funnier than other weeks’ “Saturday Night Live” skits, and that’s really what Super Bowl commercials are. They’re these clever thirty-sixty second skits that are entertaining and the viewers like to watch. So that when we on “Super Bowl’s Greatest Commercials” string them all together as a one-hour show, that’s why it does so well because people love to be entertained watching them. ANDELMAN: I was just thinking of another analogy with “Saturday Night Live,” actually. When that show begins, just like the Super Bowl, everybody is on their edge of the seat. What’s it gonna be this week? How’s it gonna go? And usually, just after “Weekend Update” or in the case of the Super Bowl at halftime, interest starts to peter out so you need something to keep it going. And in the Super Bowl case, you’ve got the commercials. ANDELMAN: Did you ever imagine you’d be doing this for what I guess is eight years now? HOROWITZ: Yes. No, no, no, although every year, it’s funny. We sit there before the show, Steve Mayer, myself, the other executive producer, and we go, “What should we do differently?” And we both have this — call it a governor — where we’re just careful that if we go too far, one pitches the other one and says, “Just remember, people just want to watch the old commercials. We don’t have to be so creative.” The creativity was already done when the commercials were made. ANDELMAN: Tell me about the show. It’s a countdown format, right? HOROWITZ: It’s a countdown format in the show where we have selected, over the years of doing the Super Bowl commercials show, we mulled through all the various commercials. We’ve had fans vote on them. The producers of the show come up with the Top 10 commercials. They’ve been parked on cbs.com, so over the course of January, viewers and online users have been able to go to cbs.com to view those commercials. They’ve voted on their favorite. And in the show, we start with number 10 and count them down. Jim Nantz and Daisy Fuentes go from 10 to 9 to 8 to 7 to 6 to 5 to 4, and when we get to 4, and we stop, and we announce the final three, the top three commercials as voted on over the past month on cbs.com. And then we open it live to viewers across America on CBS to vote on one of those three spots as their favorite commercial of all time. And what was at stake was a Super Bowl game where we had New England going for the first perfect, perfect, perfect 19-0 season, and we had Mean Joe Greene going for a perfect 7-0. So we’ll see whether he gets unseated this year. ANDELMAN: So are you saying that Mean Joe, that Coke commercial, is in the top three? HOROWITZ: I would say there’s a good chance of that. ANDELMAN: What have been some of your own favorites over the years? HOROWITZ: “We have fired our ad agency, and we’re out two million dollars.” How much did that cost? Ten dollars to make, right? And yet, it made the point of what FedEx is all about. It’s not always about the gazillion dollars and the special effects even though some of those are very, very clever. Anyway, those are some of my favorites. ANDELMAN: Bob, how important is, and maybe we can kind of balance these, humor in these commercials versus talking animals versus celebrities? Is there a hierarchy of what works and what doesn’t? HOROWITZ: No, I really don’t think so. The P-Diddy stuff was great. The Cindy Crawford/Pepsi stuff has been great. Michael Jordan, Larry Bird, all those celebrity spots, the nothing-but-net, all great. HOROWITZ: Celebrity at the right moment, celebrity meets clever — great. I love that. I think the animals tug at your emotions. I think those are the other group of great spots. Either the emotion or the celebrity clever. ANDELMAN: Bob, am I wrong in thinking that the humorous commercials are usually the most successful? HOROWITZ: No, I think you’re probably right. I would say the most successful, as in the water cooler conversation. Most successful now, now you have the USA Today ad meters like the ratings in the morning. They come afterwards, and it’s not necessarily all about the funny, the humorous. I think, though, if you’re talking about water cooler voting, you’ve gotta be funny. You’ve gotta be funny. HOROWITZ: And have her wardrobe malfunction, yeah. ANDELMAN: I can’t say we thought it at the time, but in retrospect, that spot did as much for turning around his public image as Britney Spears publicly crashing and burning since then did for him. HOROWITZ: Exactly, exactly. And again, I find that Kevin Federline and his management team was quite clever to do that spot of him flipping burgers because it was self-deprecating. He made fun of himself, and I think that got people to maybe think just a little bit nicer of Kevin Federline. We actually have him in the show. I can’t give away what we’re doing, but we will show that spot again, and then we did a very much “Saturday Night” take-off skit with Kevin in this year’s show that he cooperated and leads us through some commercials. ANDELMAN: I would have never guessed that a year later, I would actually think more of him than of her. It’s interesting. ANDELMAN: Long term, do you have any thoughts on which brands have benefited the most from their Super Bowl spots? HOROWITZ: That’s a good question. Probably Budweiser. I would say Budweiser and Pepsi. Coke has had great ads, but I think the Pepsi ads have been very funny and have done a lot for Pepsi and the same, obviously, for Budweiser. But there, you’re talking about two either brand leaders or number one, twos that don’t necessarily need the Super Bowl. Budweiser has eight spots in the game. They’re going to be number one no matter what, but as old man Wrigley said in advertising to some reporter that was asking him, “Why do you advertise when you have 100 percent market share with Wrigley’s gum?” And they were flying in a propeller plane, and he said to the reporter, “Look outside. Just because we’re flying along fine doesn’t mean you cut the engines.” So I think if you’re Budweiser, you do it because you’re the market leader and people expect you to do it. And I do believe deep down inside why it gets the big rating is people are looking for Budweiser to do that. They’re the creative. So Budweiser and Pepsi would be my answer. ANDELMAN: And what is the mark of an unsuccessful commercial that debuts on Super Bowl Sunday? HOROWITZ: I’m not going to say any by name. Part of the unsuccessful is that I don’t remember who they are. But I think a lot of the dotcoms were unsuccessful where they got to be too cute. They tried to play like FedEx, and it fell flat. Look at the godaddy spots, godaddy.com. That’s pretty unbelievable. The ads might be a little disgusting, but they definitely are clever. There’s one that maybe does something to push the needle and be a little affecting, and they’re successful for a different reason. ANDELMAN: I’m thinking back to last year, and I remember that at the end of the game, we looked at it and were talking about the commercials, and it just seemed like there were a lot of people that had spent a ton of money on commercials that they thought would dazzle us, and they weren’t funny. They didn’t really get the point of their product across, and they weren’t memorable. And I can’t even think of those brands now, but I remember at the time thinking man, what a waste. HOROWITZ: Right, right. Think about it. That’s a godaddy.com. Where do you see godaddy spots? Really nowhere other than the Super Bowl. And so they’re ones that you’d say I guess they’re successful because look at every year, eleven months, three weeks later, we’re still talking about them versus those that you say I can’t remember, but I know there were some there that weren’t good. And therein lies the point of they just weren’t good cause you don’t remember them. ANDELMAN: And, Bob, have you ever done commercials? Have you ever worked in that medium? HOROWITZ: No, no. As an avocation, yes. I’m involved in the marketing of our TV shows, and I’d like to think that my fascination with Super Bowl spots is I like to be creative with promo spots or if I were to be dabbling as a producer, but I have not done it as a profession, no. ANDELMAN: Have you already seen 2008’s Super Bowl spots? Are you privy to those? HOROWITZ: We’ve seen some of them, the GoDaddy spots. We’ve seen one of the Budweiser spots where the Clydesdale and the Dalmatian, the dog, are training together. Some of them we have seen. You’ll have to watch the show to see cause it’s embargoed until tomorrow night, but the Budweiser one is very good. ANDELMAN: Do celebs have any edge over talking animals? HOROWITZ: No, I don’t think so. We talked about the Kevin Federline spot. I think that was great, right? Then you remember the Budweiser spot with the chimp that was talking, right? That’s great. I really don’t think that it really, really matters. It’s just all about that which is clever. Again, go back to your “Saturday Night Live” analogy: they always have the guest star on “Saturday Night Live.” The skit is funny, or it’s not, really having nothing to do with whether the star that night is in that skit. Sometimes when they’re the main character, and they nail it, it’s really, really funny. And that would be the equivalent of a Super Bowl spot that has marquee talent doing the commercial, Kevin Federline, right? And the Kevin Federline Super Bowl spot could be “Saturday Night Live.” But then again, you could see the “Saturday Night Live” skit in a “Saturday Night Live” show that just happened to not have the star as the main character there, and it was every bit as funny if not more funny. It’s just entertaining. It really depends. ANDELMAN: Wasn’t your co-host, Daisy Fuentes, in a Super Bowl commercial some time back? HOROWITZ: Oh my God. You’re asking a question there that I don’t think is the case, but I don’t know that answer. I don’t think so, but maybe. ANDELMAN: Let’s get our crack research team working on that. Maybe somebody can get back to us. HOROWITZ: What’s your favorite spot? What’s your favorite commercial? ANDELMAN: I’ve always liked Spuds McKenzie. ANDELMAN: I’ve always liked the animals. I like the horse kicking a field goal. I don’t know why. HOROWITZ: You mean the one with “I think they should’ve gone for two”? ANDELMAN: I know what I didn’t like. It was actually a FedEx spot, which I just thought was dumb, was the cavemen. ANDELMAN: Where he steps outside and gets squashed by the dinosaur. HOROWITZ: He kicks the dog and then gets stepped on, right. HOROWITZ: That scores pretty well in our show. ANDELMAN: That one just didn’t work so much for me. HOROWITZ: I have to say I have to agree with you that it has scored well over the years, but I don’t necessarily like it. Do you remember the Chevy Chase one, the one for potato chips, where they stopped him in the middle of the commercial and he got cancelled? ANDELMAN: I’m thinking about that now that you mention it, yeah. HOROWITZ: That was a great one, too. ANDELMAN: Do you feel at all guilty creating a show in which all the programming is commercials and the content is then surrounded by more commercials? HOROWITZ: No, because if you didn’t have the commercials in the Super Bowl game, the rating would go down. I’d argue that to my grave. That, I believe, is a truth so why then is that the case? Because they’re entertaining. So to build a show around entertaining content that just happens to be old commercials surrounded by natural commercial breaks, it is what it is. I can’t say anything more about it than that, and I think that is the case. You have to think of them as little vignettes a la “Saturday Night Live” that they go on the air to sell, right, to entertain and sell, and then they walk off to become content in a primetime CBS Super Bowl commercial show. That’s their life after first air. ANDELMAN: Do the brands whose commercials you run from past years, do they benefit? And I’m sure the answer to this is no, but do they ever pay anything for this new exposure? HOROWITZ: No, and in fact, it’s to the contrary. When I first came up with doing the show and we sold it to CBS, people said, “Whoa, you guys must be making a lot of money because this is all free.” Well, what people don’t necessarily understand is that when the company gives you the right to run a commercial, there are all the clearance costs, which is the music, the talent, the director, all the actors, everybody that’s involved. And the clearances to clear the spots on our one-hour CBS primetime show is upwards of $200 grand. We’re sitting there saying “Do we put in the Budweiser spot?” “You know the Budweiser spot’s gonna cost $15,000 to run,” because there is a budget. But the companies, they gladly like to see you run something. We had on for numbers of years the Terry Tate Reebok spot, and then the Reebok and Terry Tate relationship kind of went sideways. You haven’t seen that on the air in our show, and yet, I think that’s a great spot. ANDELMAN: Have any of the brands, any of the companies, ever declined to participate or release their ads? HOROWITZ: Not really, no. No, no. ANDELMAN: None that you really felt you had to have. HOROWITZ: No. Exactly. Any of the ones that were important we’ve gotten. ANDELMAN: Let’s get a nice word in for your hosts. Daisy Fuentes and Jim Nantz, have they done this special before? HOROWITZ: Yes, yes, for a couple years. They did it last year. They did it this year. It’s a great complement because Jim hosts the show, will host the show from the stadium where the Super Bowl is played, and so he is the staple to give you the countdown. And then this year, we have Daisy at our own Super Bowl party where she’ll be with fans and some guests, etc., and they’ll go back and forth. It adds a little entertainment value besides just seeing two people standing next to each other. ANDELMAN: I want to change gears since we have you here. You have another little program that’s been a bit of a hit, “The Singing Bee.” Can you tell us a little bit about how that came to be and where the future for that show is? HOROWITZ: Very similar to “Super Bowl’s Greatest Commercials,” which was an observation of human behavior, this one was observation walking down the street, again, in New York City, of a marquee that was for The 25th Annual Putnam County Spelling Bee, the musical. Spelling Bee, the musical? Well, why can’t there be “Singing Bee,” the show? Spelling Bee, they have to spell the words. Sing the words. Okay, lyrics. And like most ideas and what you have do is you have to stop for a while because usually after 24 hours in that incubation period, 99 percent of the ideas you had 24 hours before are terrible. HOROWITZ: Because it’s just oh, what was I thinking? But this one, 24 hours later, was, “Hey, that’s a pretty good idea,” so we threw it in the whole development mix, and I spoke to Lewis Fenton, who is our head of development. We got Phil Gurin, a buddy of mine, a longtime friend, to partner and develop with us, and we came up with this variety game show with a great host in Joey Fatone. We’ve done 19 episodes on NBC. It’s now being seen in 35 countries around the world all in, except for Australia, all in native tongue. They do it with their own local songs, and it’s a hit around the world. And here, we plan to have it back on NBC this summer. We’ve done 19 episodes so far. I tend to believe, as does Phil, that we’re more of a summer show than we are of a fall show because I just think it’s summer fun entertainment. And it has proven to be a winner, and we got lucky. ANDELMAN: That’s amazing that it’s in that many countries. A wild hair becomes a franchise, I guess. HOROWITZ: Right. Well, everybody sings lyrics that they think they know that they really don’t know. Again, it’s just playing off of human behavior, people singing in the car, those who sing in the shower. It’s just been a big, big hit. ANDELMAN: Do you have a return date yet? HOROWITZ: No. That’s what we’re discussing right now with NBC. HOROWITZ: Our focus and emphasis right now is on our global shows and our producers that are in Chile and Israel and all around the world, Turkey, Russia. We’re doing 80 episodes in Russia. We were the number one show in Scandinavia. It’s a pretty amazing story. ANDELMAN: In the NBC edition, will Joey Fatone and the Honey Bees, will they return? HOROWITZ: Yes, Joey for sure. And I think while the Honey Bees are not the hosts, they are a fun, entertaining side, but all that being said, I think to keep a success going, you always have to zero base and figure out what’s a new, improved thing. You tie it back to what we’ve been discussing, Super Bowl. New England goes on to beat the Giants and are 19 – 0. They’ll have 46 players that will suit up for the game. All 46 players won’t be back the next year because they’ll just do something new and different to try to win again. Phil and I will go back, and we’ll figure out how best to use the Honey Bees, and I can’t see that show without Joey being our host forever. He is so tied to that show and has been such a big part of the success. ANDELMAN: That guy’s had an interesting career. He’s obviously a boy-band guy, and then he does a dance show. Who would’ve figured? And then now he’s doing this. HOROWITZ: Right. Pretty unbelievable. Pretty unbelievable. What a ride for him. ANDELMAN: Were you guys at all competitive in any way with the Fox show, “Don’t Forget the Lyrics”? Did anybody steal from anybody, or was it just one of those strange TV-land coincidences? HOROWITZ: Well, we sold first. We announced first. We got on the air first. ANDELMAN: So basically, Bob, you’re saying you were first. HOROWITZ: We were not second. HOROWITZ: I don’t see how people that are first can steal.